Sheriff's Deputy Dave Huhn's job has become more important after a series of hot, dry summers have made farmers more desperate for water, and more willing to steal it or go to battle over it. 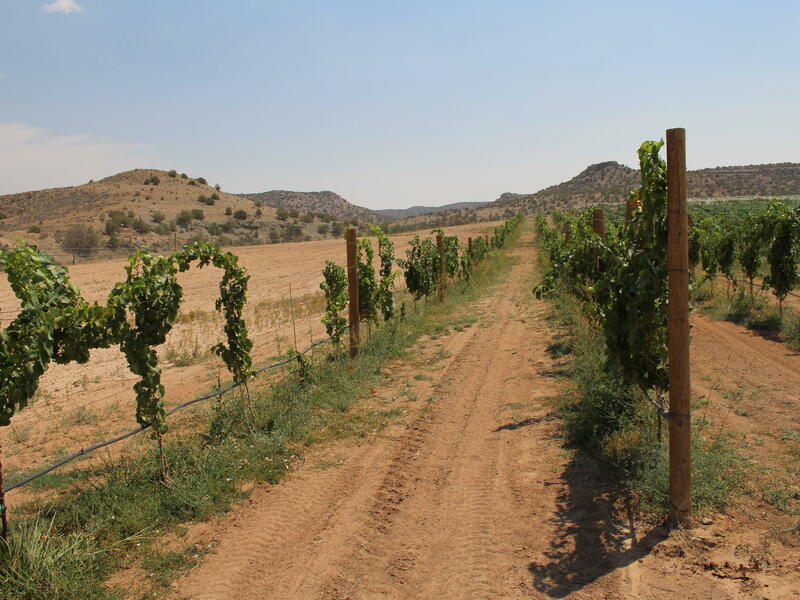 Wine grapes grow in Montezuma County's McElmo Canyon, a hotbed of water conflict according to Huhn. 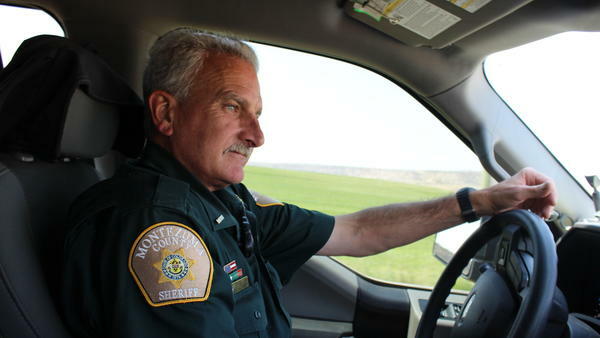 Dave Huhn is a sheriff's deputy for Montezuma County, Colo., a stretch of sagebrush mesas and sandstone cliffs bordering Utah, Arizona and New Mexico, home to Mesa Verde National Park, where ancestral Puebloans' cliff dwellings still stand. Huhn specializes in the complex world of water law. His job has become more important in this region after a series of hot, dry summers have made farmers more desperate for water, and more willing to steal it or go to battle over it. One Sunday morning several years ago, Huhn got a phone call. The woman on the other end was frantic, screaming as she watched her 82-year-old husband from the window. "It was a situation where you had two old-timers that were very stubborn and very hard-headed," Huhn says, "and they were bound and determined to do it their way. And the other party was saying, 'No you won't.' "
They were fighting over water. One of the men accused the other of taking more than his share from their irrigation ditch, leaving less for everyone else. The situation escalated to the point that their shovels transformed from farm tools to weapons. For the past nine summers, Huhn has criss-crossed the county, seeing up close the conflict that chronic aridity creates. Back in 2009, when Huhn took over as the sheriff's department's water enforcer, word spread quickly. "The very first month of the very first year, I had almost 450 calls that one month," Huhn says. "That was just extraordinary." These days, depending on the severity of drought, Huhn says he averages 60 to 100 calls per month for water cases. Water law enforcement varies across the western U.S. Water disputes — both violent and nonviolent — will sometimes find their way to the attention of local law enforcement, but due to an ignorance of what the law actually says, many deputies will simply tell the parties to hammer out their differences in state water court. Huhn says the common refrain is that conflict over water is a civil matter, and that no criminal statutes have been broken. But, Huhn says, that's often incorrect. Local law enforcement can issue citations for water violations and can police how people use and abuse the state's scarce natural resource. "You're that water cop, aren't you?" On the beat for nearly a decade, Huhn says he's known for fairly and thoroughly investigating water cases. When he shows up on scene, his reputation precedes him. "I'll walk up to the front door or out in that field to talk to whoever I need to talk to, and they'll turn around, look at me and give me a funny look and say, 'You're that water cop, aren't you?' So I've kind of gotten used to that." The majority of calls he receives are claims of water theft, Huhn says. There are a few ways to steal water. One popular method, he says, is to simply drop a pump into an irrigation ditch. Throughout the county, ditches run through people's properties on an easement, meaning the residents see the water on their land but they have no rights to use it. If they turn that pump on and divert from the ditch without the water rights to do that, it's a crime. Huhn started confiscating dozens of pumps, storing them in the evidence room, "and as they started to pile up, I was told not to do that anymore." Huhn says disputes among farmers are sometimes harder to prove. A second popular way to steal water is when an irrigation ditch runs from one property to another. One party might have rights to some water but end up taking more than their share. After consulting the local water commissioner and documents related to a water rights decree, Huhn can issue either a warning or write a ticket, just like a traffic stop. "First, people were shocked. They were like, 'You're kidding me, right? You're going to cite me over water?' I say, 'Yes, it's a valuable commodity in this state.' "
Another common citation is for failing to have a measuring device on a ditch, like a weir or a flume. Those who divert from a stream are required by state law to measure the flow of what they take. Enforcement of that requirement varies across Colorado, but not in Montezuma County. No measuring device? That's either a warning or a citation, Huhn says. 76-year-old farmer Bob Schuster has called on Huhn to help resolve water disputes among his neighbors a few times. At issue is water in a ditch that irrigates farmland in the county's McElmo Canyon, a narrow, picturesque reach of sandstone with a series of vineyards and pastures that stretch across the Utah border. Schuster grows wine grapes and hay, and he also runs a plumbing supply store in the county's biggest city, Cortez. Schuster says water conflict is a constant fact of life in the county, but droughts like the one currently sapping nearby reservoirs and streams make people desperate. "People are basically — and these are good people — basically dishonest," he says. Schuster's farm sits at the end of an irrigation ditch with a handful of users upstream. If any of them takes more than they're entitled to, the ditch dries up before it reaches his fields. "They look out [at] their fields, they see they need water and they take the water going through that's not theirs," he says. "They don't consider their neighbor needs his water." "We've had people killed over water"
Because livelihoods here are so dependent on water, emotions run high when accusations get thrown around. In true Hatfield and McCoy fashion, Schuster says he's had guns pointed at him, shovels swung at his head and been sucker punched in fights with neighbors over water. When water deliveries are being curtailed due to drought restrictions, everyone's on edge. "Water is more scarce," says Mike Preston, general manager of the Dolores Water Conservancy District. "And so you get the same demand, less water. And so that heightens the potential for conflict." Huhn's role — enforcing water law and interacting with the county's agricultural community — is unique in the state, Preston says. "To tell you the truth, I can't believe that other counties aren't doing the same," Preston says. "Once this kind of program is put in place, if it's done with a well-trained person, they're never going to want to go back to the bad old days." Back at the sheriff's office, Huhn says violent skirmishes over water have been on the decline since the county started enforcing water law. But dry years add pressure on farmers and ranchers trying to make ends meet. "Historically, we've had people killed over water in the state of Colorado. We have in this county," he says. Huhn's job has all the makings of a tall tale from the bad old days of the Wild West, with sweeping desert vistas and shootouts with outlaws. But his role now seems more aimed toward the future. The most recent science on climate change shows the Colorado River Basin, which includes all of Montezuma County, will become hotter and drier as decades pass. "We don't want the violence," Huhn says. "We don't want the fighting between families and between friends. We want to be able to resolve it in a nonviolent way." From here on out, Huhn is going to be spending more time, not less, keeping fights over water from blowing up. This story is part of a project covering the Colorado River, produced by KUNC and supported through a Walton Family Foundation grant.